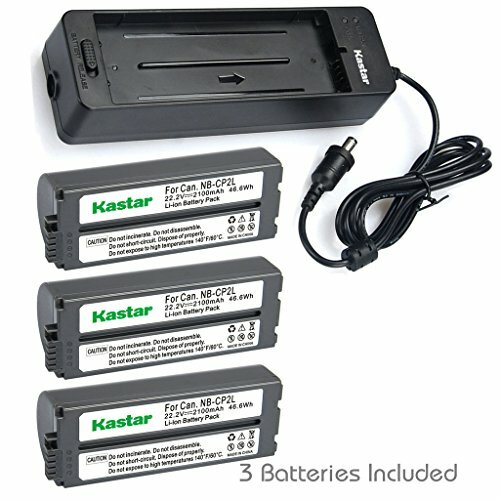 Kastar Battery NB-CP2L (X3) and Charger BG-CP200 for Canon NB-CP1L CP2L and Compact Photo Printer SELPHY CP100 CP200 CP220 CP300 CP330 CP400 CP510 CP600 CP710 CP730 CP770 CP780 CP790 CP800 CP900 CP910 by Kastar at Pacs BG. MPN: CH-3B-CP2L. Hurry! Limited time offer. Offer valid only while supplies last. Package Includes: 3 x NB-CP2L Battery 1 x CG-CP200 CHARGER Note: Batteries shoud be charged with the Kastar charger to obtain a full charge. Batteries shoud be charged with the Kastar charger to obtain a full charge.